Jo SiMalaya Alcampo and Althea Balmes placed within the top vote getters in the “Neighbourhood Arts Network (NAN) BMO Seeds Fund” contest. According to the contest’s website, it supports “artists in the development, creation and/or dissemination of a community engaged arts project” and rewards them with $1,000 in start-up funds. Alcampo and Balmes’ community comic book about caregivers was chosen as one of the top 10 finalists. The finalists, who had to be Toronto residents, competed for the most Facebook “Likes” with the top six projects winning the prizes. Alcampo and Balmes’ project, “Kwentong Bayan: Labour of Love” received over 600 “Likes” and placed third. They will use the funds towards a comic book that they expect to publish in late 2014. The comic book will document “how women are resisting the exploitative structure of the LCP and creating community,” Alcampo said, and will also look at the history of the Live-in Caregiver Program (LCP), the structure of the program, and how it impacts caregivers, their family and their friends. The LCP is an immigration program in which people, the majority of which are Filipinas, come to Canada to work as nannies and support workers for the elderly and disabled. The caregivers must live in the home of their employer and work for two years full-time as a temporary resident before they qualify to be a permanent resident in Canada. The caregivers are not allowed to bring their family to Canada when they arrive, which causes years of separation between caregivers and their relatives, including their spouses and children. Balmes wanted to create the comic book to “dispel any sort of stereotypes in our community and how caregivers are looked down upon,” she said. “We want to document the community’s resiliency, how they overcome challenges and still form a thriving community,” Alcampo said. “Kwentong bayan” means “community stories” in Tagalog. The comic book is made in collaboration with the community, especially caregivers. Their process for creating the comic book includes Alcampo and Balmes consulting with caregivers to find out what their issues are to hear their stories. They then reflect with each other in weekly sessions and go back to the community for more discussion. For instance, they have worked closely with the caregiver support group, Caregiver Connections Education and Support Organization (CCESO). They wanted to be open with their process and their interactions; thus they will also be featured in the comic book. Bank of Montreal Financial Group and a network of Toronto-based artists called Neighbourhood Arts Network sponsored the contest. Balmes is the illustrator and Alcampo is the writer. Alcampo and Balmes plan to use the start-up money to help fund the creation of a 50-page graphic novel style comic book with an expected publication in late 2014. The comic book will be segmented into short stories with an ongoing narrative. They will publish excerpts of the book on their website throughout the next year and are currently fundraising for its printing. Potential sponsors can contact them at lcpcomicbook@gmail.com. They will also be publishing a mini-comic book this Fall with The Graphic History Collective, which is a group of artists that initially came together to produce a historical account of May Day and labour rights in Canada in the form of a comic book. The collective invited Kwentong Bayan to be a part of “The Graphic History Project” in which they are contributing a 10-page comic book about the lives and labour of live-in caregivers. The anthology of close to 20 graphic history comics will be published online. While they have never made a comic book before, they have both been recognized for other artistic skills as filmmakers. Balmes’ short film “Suman Ladies” was awarded as the Best Film by a Female GTA-based Artist at the 2012 International Reel Asian Film Festival. In 2003, Alcampo won the Mikey/Shmikey Audience Award for Best Short Film or Video for the film “i am good inside” at the Inside Out Festival. Alcampo and Balmes plan to continue consulting and engaging with the community on Kwentong Bayan and related projects. During the upcoming Pride celebrations in Toronto, they will be marching daily in solidarity with Queer & Trans Migrant Workers, Newcomers, Refugees and Non-status folks and activities will include some “larong pinoy” or Filipino street games. 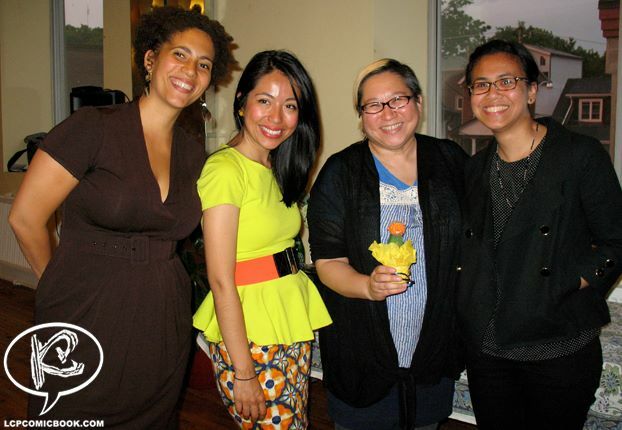 PHOTO (L-to-R): Ella Cooper (Neighbourhood Arts Network Senior Coordinator), Angie Aranda (Neighbourhood Arts Network Outreach & Events Coordinator) Jo SiMalaya Alcampo, Althea Balmes. Photo by Kwentong Bayan.